Arriving at Bells Hotel, Coleford, about mid-day everyone was slightly anxious about the weather because storm Brian was due to arrive with 70 m.p.h. winds and torrential rain. 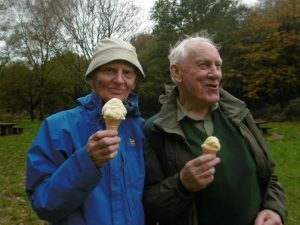 However as Bob Hurn and Dave Sayer led the first walk over the Bell’s golf course the sun came out briefly. Passing through fields of solar panels on both sides the track suddenly disappeared and we had to push our way through under growth to reach a reasonable track to Clearwell. After a short stop by the Gothic Church, we headed back through Whitecliffe with clouds getting darker and rain starting we reached the Bell Club House in good time to prepare for the evening meal. Next morning a short drive to Speech House, then the rain started as the cars were parked. Everyone put on water proofs – much easier when standing by a car for support. However, the rain soon stopped and when we reached Cannop Ponds the sun came out and the stone crocodile could be seen in the water by the over-flow. After a brief stop the path down by the pond brought us to a van selling drinks, snacks and locally made ice cream. Refreshed we mostly walked in the shelter of the trees whilst pausing to watchoff-road cyclists doing death defying flying jumps over humps in the track. The rain returned about 15 minutes before we finished. When we arrived back at Speech House Hotel we shed the water proofs, and all went in for a high tea with scones and cakes. Sunday was calmer and we walked from the Long Stone through the trees of the Forest of Dean to Symonds Yat(East). The views are wonderful but the way to the view point is hand railed decking. A long descent to the river side rewarded us with the sight of canoeists flinging themselves into the river so that their colleagues could practise throwing ropes to rescue them. Then came the climb up to High Meadow for the lunch stop. Coming out of the trees at the top the wind nearly blew us off our feet. So we descended a little and found a sheltered rocky out-crop for the lunch break. The return was through Staunton where the sun came out and the path over open ground by Buck Stone allowed us some views over open countryside. In the evening Hilary left early to return home to look after her daughter coming out of hospital. Everyone else met in Dave and Nicky’s large sumptuous room for drinks and nibbles prior to the evening meal. Monday morning only four of us had a short walk above Tintern Abbey before returning home. Thanks to Hilary for arranging the booking and thanks to Bob Hurn and Dave Sayer for leading the walks.